Managed futures have unique features given that margin is only a small potion of the total investment. This allows for active collateral management in ways that are more impactful from other hedge funds. For most hedge funds that use a prime broker and make long/short equity investments, the focus of collateral management is with reducing the cost of borrowing. For futures, the leverage is not through borrowing but through the ability to increase notional funding based on the level of margin to equity. A good portion of funds given to any CTA is not managed efficiently but rather just held in cash. Surprisingly, there has been reluctance by managers to actively invest collateral. There is the view that the investment should be "pure trading" through futures, yet the trading strategy may compete against investments that have an inherently longer duration than cash. The management of collateral can be a form of value-added management that effectively reduces the cost of the fund management. 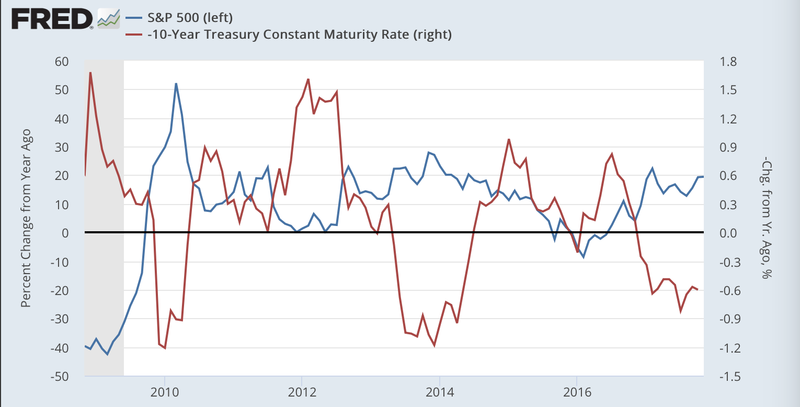 The cash rate have moved higher with 3-month Treasuries up 76 bps since the beginning of the year so funds have gained on nice tailwind with their performance even if cash return is not included in the performance fee. A simple look at yields even along the short-end of the curve will show the potential for value creation. The difference between 4-week and 1-year Treasury bills is currently 46 bps. The difference between 1-month and 12-month LIBOR is 61 bps. The difference between 15-day and 180-day high quality commercial paper is 37 bps. Just taking some extra duration risk or extra credit risk can significantly defray management fees without significantly impacting funds risks. Better cash management is all the more important for lower fee funds. Active cash management can control for inflows and outflows and rate changes, but in a higher rate environment, the opportunities for improvement are significantly better. Better cash management is an effective tool for CTA's in the world of higher Fed target rates. The asset allocation decision concerning the addition of alternative investments, especially for diversification strategies, is actually quite straightforward. One, find strategies that have low and stable correlations with stocks and bonds. Two, find strategies that have a minimum acceptable return that will beat a traditional diversifier. The diversification criteria are easily measured. Look for stable low correlation strategies across a market cycle. Of course, longer track records are required to conduct this analysis. 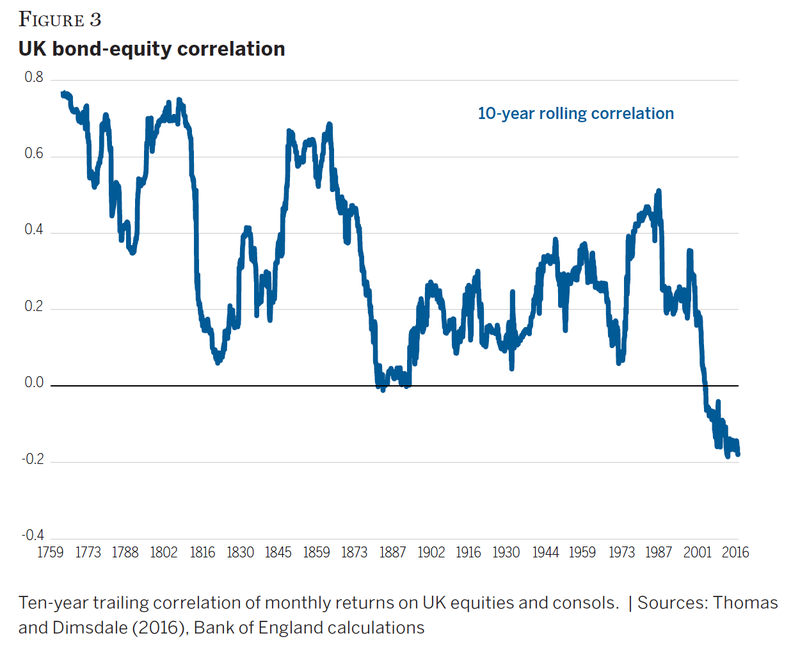 Correlation stability is critical during a crisis when it is expected that correlations will rise to one for many asset classes. Bonds have been a good diversifier given their negative correlation to stocks and their ability to generate gains during flights to quality. Nevertheless, the negative stock-bond correlation, which has been a fixture for portfolio construction, may not always exist. Hence, it is also important to look at return alternatives. A minimum acceptable return is relevant because the forecasting the expected returns may be difficult. The focus should not be on current returns but whether a given strategy can be consistently above a minimum threshold through accounting for the expected return and volatility. An alternative should have an expected return of between 2.35 and 3.6% to match the yield between a Treasury and investment grade corporate bond. Of course, there is the impact from a change in yield. If bond yields fall there will be a gain based on the yield change times the duration of the bond. If yields rise, the breakeven will be lower as the return declines. 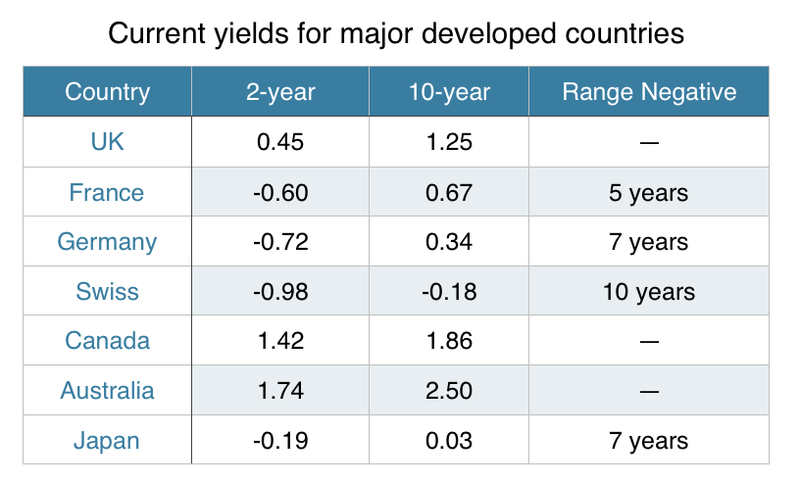 The case for switching in the rest of the world is significantly greater with many current yields negative in Europe and all 10-year yields below the US except for Australia. You have to go beyond 5-years and out to 10-years to get a positive yield in Europe. This is not new information, but it is important to highlight the low cost of switching especially in a rising rate environment. 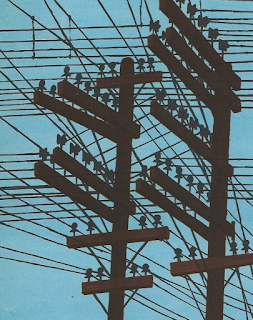 The switch to alternatives, especially for diversifying strategies, is still attractive. The case is further strengthened if there is an expectation that rates will move higher and dampen fixed income total returns. The bond diversification story is based on the strong negative correlation between stocks and bonds that has existed for over a decade, yet it is not a given that stocks and bond returns will move in opposite directions. A quick look at a very long history from a Wellington Management chart tells us that the negative correlation is the exception not the rule. 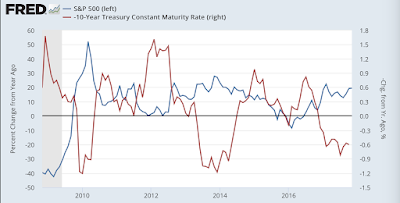 The current relationship between stock and bonds continues to follow the usual pattern with stock gains associated with bond rate increases (the chart shows rate increases as a negative change). 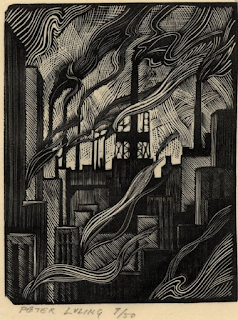 There is little to suggest that we will see a change other than history tells us to be careful. 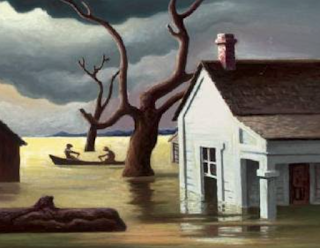 Nevertheless, history may be a good guide to help with longer-term asset allocation. If the stock bond correlation goes back to normal which could be above .2, there would be a sea change in portfolio volatility. Higher correlations between stock and bonds would mean a higher overall volatility as the cross-asset covariances rise. An effective way to help offset some of that risk is to look for strategy diversification. 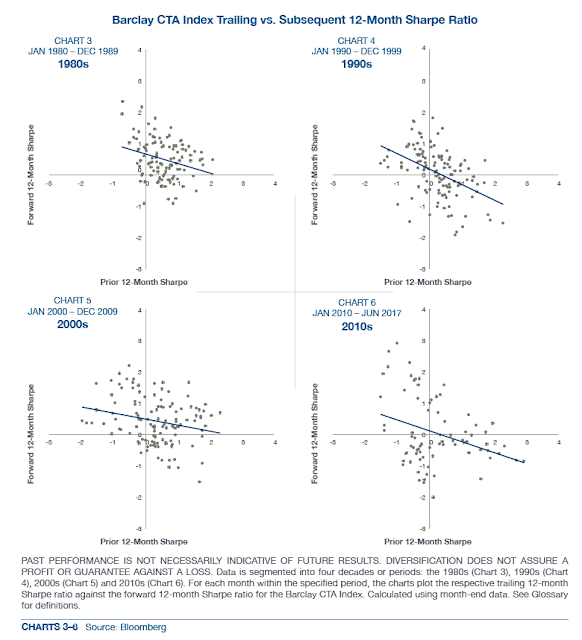 Low correlation strategies which have higher expected returns than current bond returns would be a good fit. These alternative diversifiers would be strategies that focus on relative value or strategies that have long/short exposure across asset classes like global macro and managed futures. Along with any discussion of asset bubbles, there is a complementary discussion concerning tail risk. If there is a bubble, there is likely to be a tail in the future. Bubbles and tails are tied together, yet tail events can occur even if there is no bubble. Tail events are driven by unexpected regime changes that cause a significant change in investor expectations and capital flows. 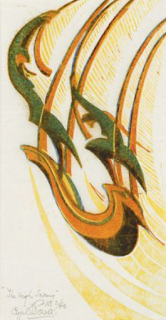 The tail is created by a surprise loss that feeds into a feedback loop of selling and uncertainty. A tail risk is fundamental for any risk management discussion. Nevertheless, our ability to predict tail events is poor. 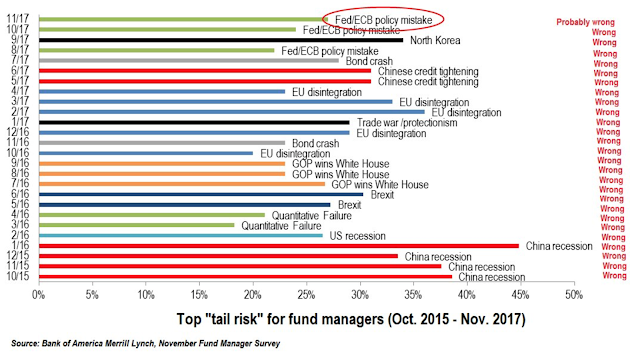 My qualitative view is that no tail event has ever been effectively predicted by the majority of fund managers. Investors often try to describe the next tail event but by their nature, these events are surprises. Just because these are low probability events does not mean they will not have an impact on prices. Changes in probabilities for these tail events will impact expected returns. What is more useful is the expected chance of a tail event, not the identification of the event, but we can get that from option prices through the smile. The Bank of America Merrill Lynch chart shows the top tail risks identified by fund managers each month over the last two years. What is interesting is that there is an ebb and flow on the likely tail event each month. Since tail risks are low probability events, it is likely we will get these events wrong. The market may have predicted a GOP win as a tail event, but it is less likely managers were in agreement that this would be a positive right tail event. The most critical action for fund managers is not identification of a tail event but the diversification response to a possible tail event. The tail events listed are global and affect many markets. A single risk management approach like protection through put options will not do. The portfolio diversification necessary is through strategies that can go both long and short and can be event classification agnostic. From our view the strategy that will be most effective is systematic trend-following. There is no need for identifying the event. There is no need to pick the probability of the event. There is no need to locate the markets that will be affected. Price action through trends will tell the systematic manager what to do; buy markets that are rising and short those that are falling, and if you are on the wrong side of the trade have stop-loses take you out of positions. This non-predictive approach is an easier more direct method to solving any tail problem. Diversification can come in many forms. One that is not often discussed is holding period diversification or the time- frame used for making a trading decision. Some strategies are successful based on the expected holding period of the investment and not just the trading process employed. For example, there could be two price-based systematic managers who use similar models, yet they will get very different returns based the calibration of the holding period, short-term versus long-term. In the case of trend-followers, there are some trends that last only a short-time and can only be captured through trading a short time-frame versus other trends that can last for weeks, months, or quarters. These are captured differently based on the look-back or speed of the models. Trend-following managers will often use models with different look-back periods to add diversification by capturing different market reaction speeds to different shocks or events. Longer-term models will often pick-up time varying risk premiums associated with the business, credit, and monetary cycles. Shorter-term faster models will capture announcement shocks which generate transitions to new equilibrium. These fast models are trying to capture dislocations in liquidity from imbalances between buyers and sellers. 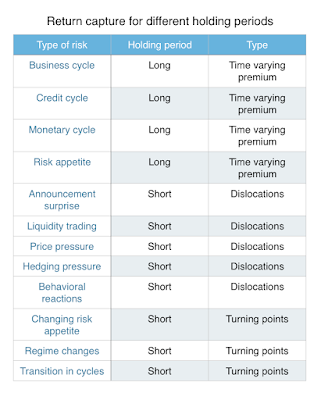 Many systematic managers explicitly mix time-frames or holding periods to smooth return patterns. Investors can do the same thing through choosing managers that have different return holding period focus. A long-term trend-flooder can be matched with a short-term trader so an investor can capture price trends associated with risk premiums and with market shocks. Low volatility may provide strong signal to noise for longer-term trend identification while higher volatility may allow for more dislocation opportunities for shorter-term traders. Trading style and time diversification is one of the easiest methods for return smoothing within the hedge fund strategy space. Strategic asset allocation as the name implies requires long-term return assumptions. There are often wide variations in the future forecasts. Many forecasts we have surveyed show positive expected returns, but the numbers are significantly lower than what investors have seen historically since the Financial Crisis. In general, Research Affiliates provides a good tool for analyzing the past and expected returns that we find helpful. Fixed income annualized returns are still expected to be positive albeit closer to zero. Equities are expected to be, in many cases, half of what has been seen over the last five years. This does not seem unusual given the recent equity performance that is viewed as being in a bubble, but it is sobering to realize that overall returns for any allocation will likely be much lower. Pension will not be able to hit their return targets. Similarly, there is a general increase in volatility over the next ten years as risk mean-reverts from their extreme lows. Many investors may feel destined to underperform performance target with higher risk if they follow these numbers. 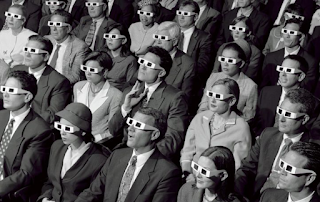 So what can an investor do to break-out of this low returning asset class world? The best way may to change the rules of the game by asset allocating across strategies or risk premium and not asset class. This will not guarantee higher returns, but it changes the framework and enhances the set of possibilities. Allocations to hedge funds may be the easiest way to enhance the choice set. 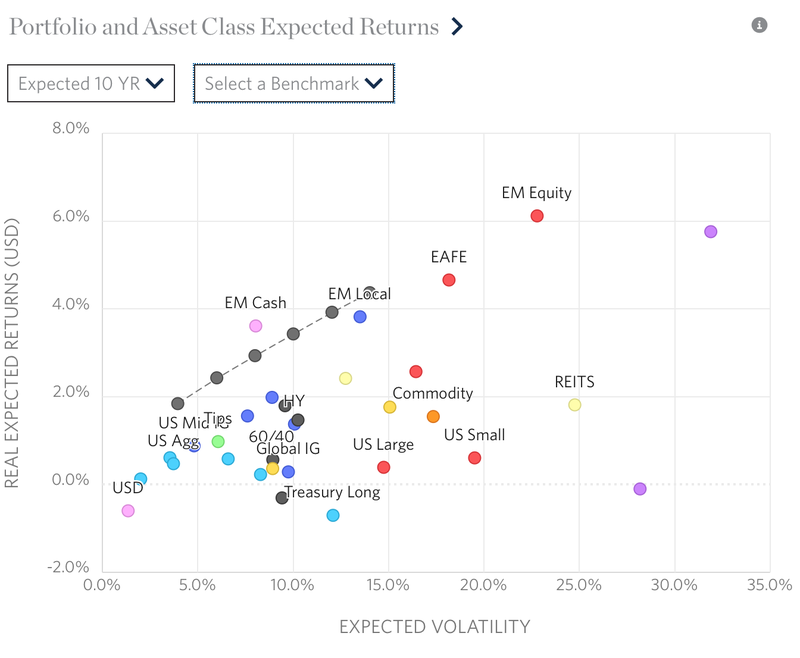 One the one hand, lower asset returns will reduce the beta opportunities for hedge funds, but an increase in volatility will increase the dispersion of returns and opportunities which will allow for potential alpha generation. There are a host of reasons for alpha opportunities, but in general, more dispersion means greater opportunity for dislocations regardless of the expected factor returns. Given that hedge funds may be better able to control volatility, any optimization will tilt away from asset class market betas. The name of the game may be to focus on strategies not asset classes. We believe that a volatility shock will generate a feedback loop that will force equity prices lower. High leverage tied to volatility targeted risk management will mean that any increase in volatility will lead to portfolio rebalancing and position cutting. 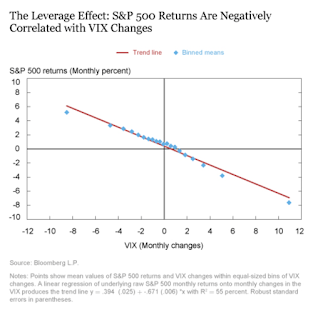 This negatively correlated leverage effect between equity returns and change in the VIX is real, as measured by researchers at the New York Fed, see "The Low Volatility Puzzle: Are Investors Complacent?". 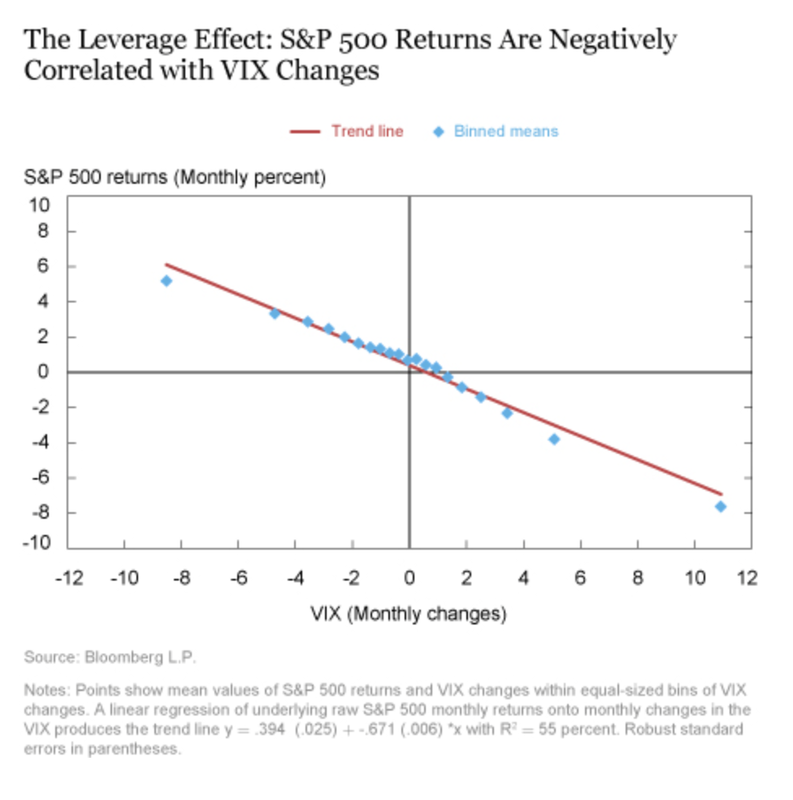 The key question is the degree of mean-reversion in the VIX. If there is a strong mean-reversion and the seeds of a volatility shock exist in the price dynamics of the VIX, there is a large investor problem. 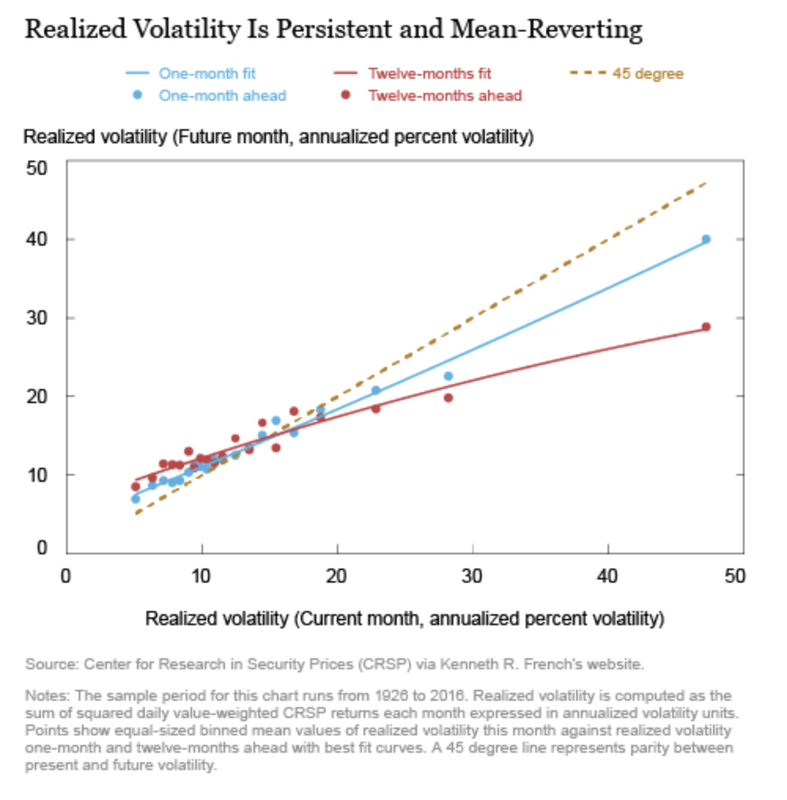 If there is limited mean reversion, the likelihood of a volatility increase is reduced. 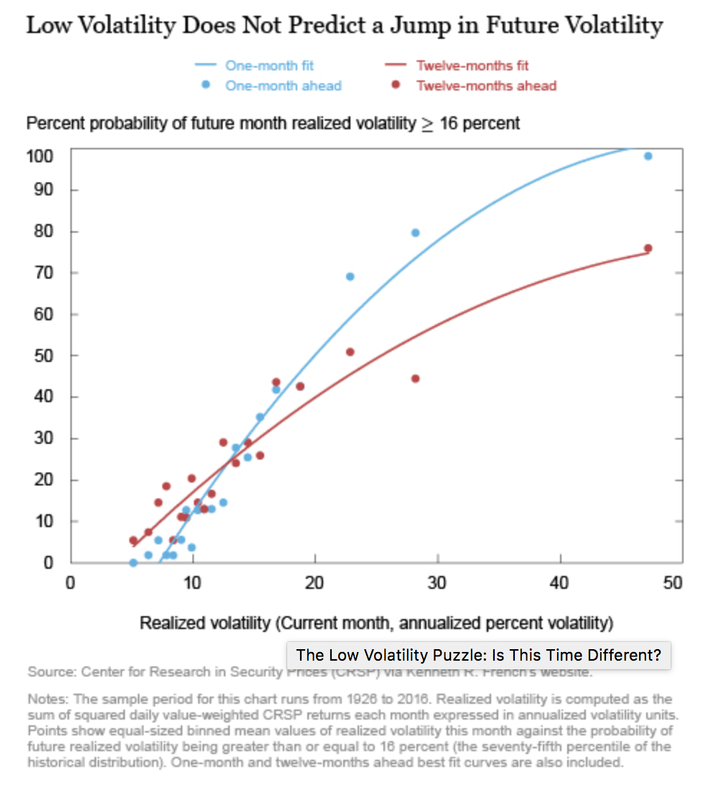 The researchers at the Fed have also opined on this issue, in their blog piece, "The Low Volatility Puzzle: Is This Time Different?". There is mean reversion but it is slow. Low or high volatility will not persist but the adjustment period is long. There is also limited evidence that there will be a jump in volatility when it is low. 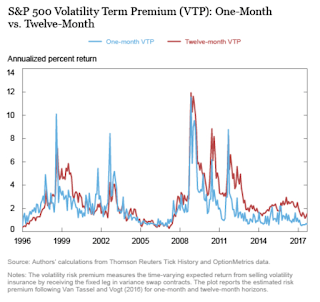 Finally the volatility term premium has persisted to be higher for longer horizons which suggests that the market still views volatility will be higher in the longer-run. 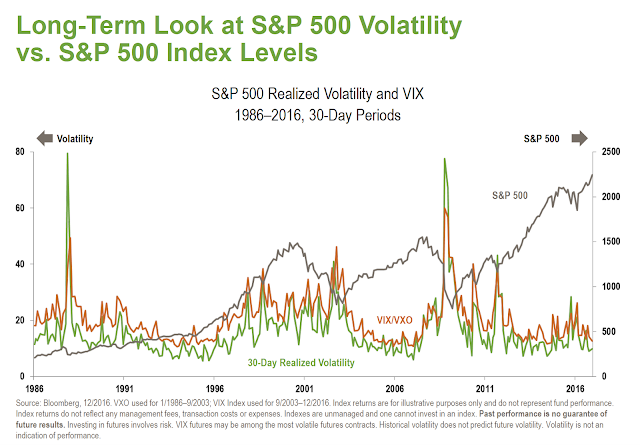 The data show that a volatility spike is not embedded in fact that current volatility is low. The argument for a rise in volatility has to be focused on some event that will serve as a volatility shock catalyst. The market will need an economic surprise that will change the dispersion in investor expectations. 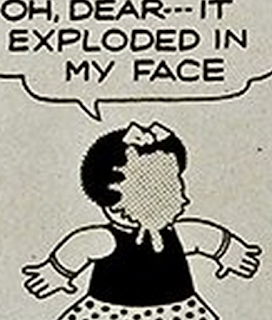 These shocks by definition will be unanticipated. An initial shock may lead to the feedback loop we have described in the past which may turn into a non-linear event unlike what the data has predicted in the past. 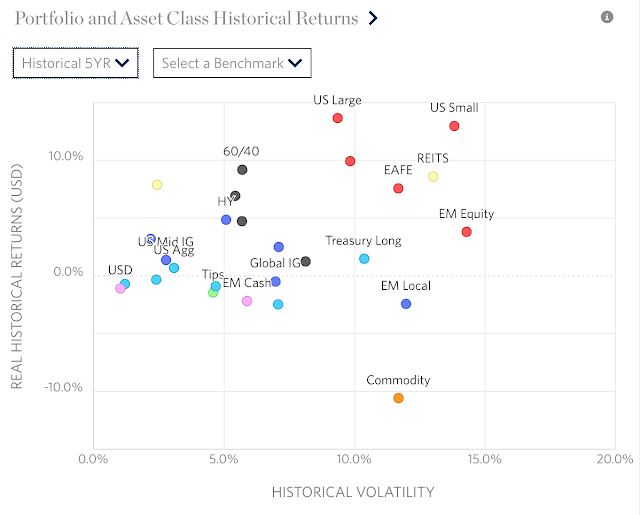 Being short volatility is risky in a crisis - Do you know your volatility premium exposure? 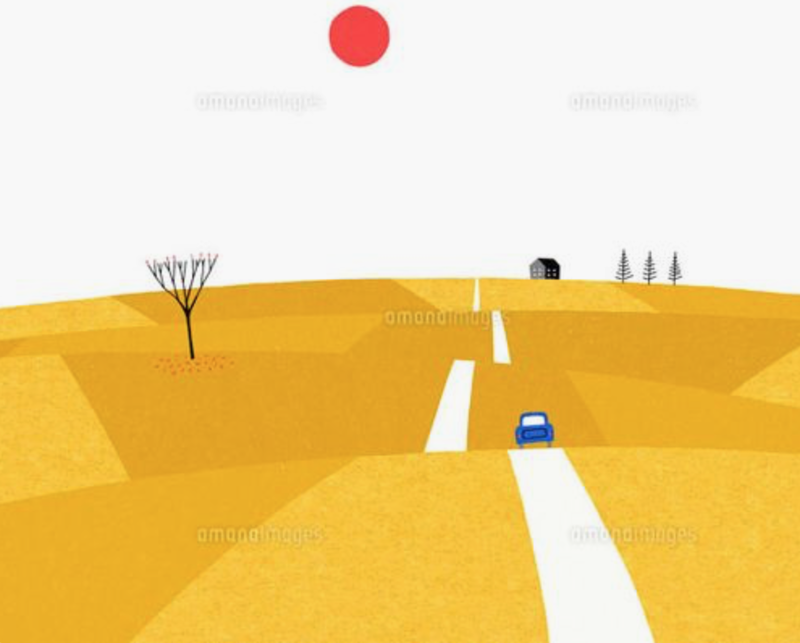 Investors have shifted their focus to alternative risk premiums as a method for defining and allocating risk within a portfolio. 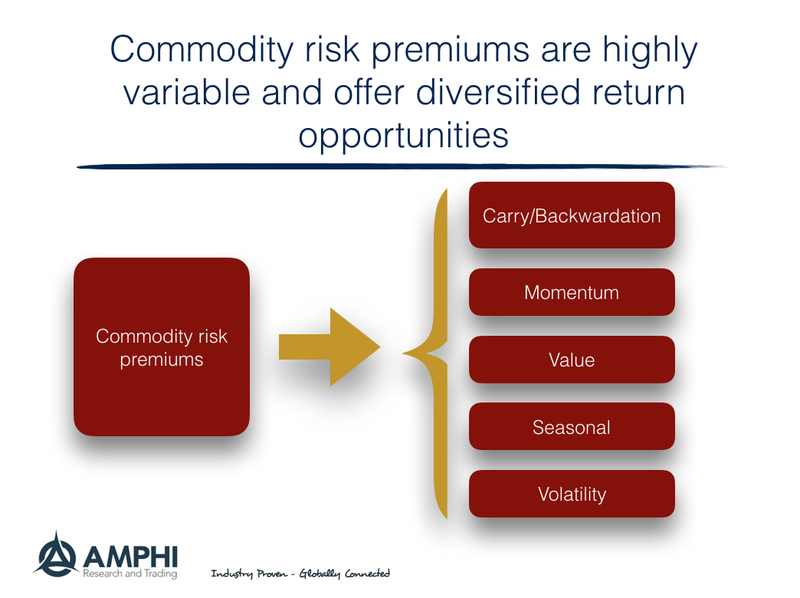 The alternative risk premium framework can be employed in all asset classes but is especially useful in commodities given the large dispersion in markets and structural features that lend themselves to time varying risk premiums. Carry/Term/Backwardation - (Backwardation/Contango) - There is more variation in backwardation across commodities and through time than what can be found in other markets given the sensitivity to inventory changes, supply shocks, and hedging pressure. The changing supply dynamics and demand for hedging creates a greater number of "carry" opportunities. 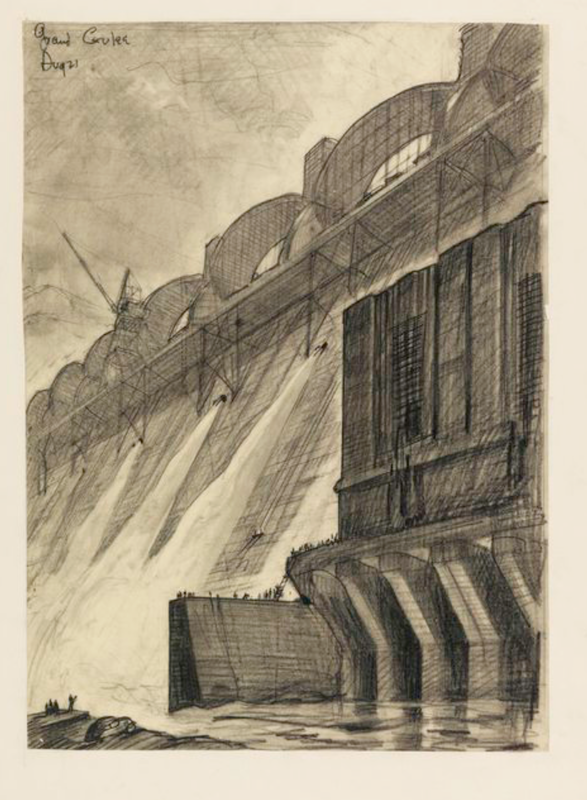 Momentum - (Time series/Cross-sectional) - Given the inelastic demand and supply for many commodities, there is likely to be greater price responses to any shock. The use of futures as a hedging tool means that many trades are not done for profit maximization but risk considerations. This creates trend and momentum opportunities. Value - (Long-term price levels) - More so than other markets, long-term price can be serve as a value indicator. 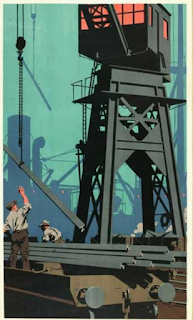 As often commented by market pundits, the solution to high (low) commodity prices are high (low) prices. Extended periods of low prices will lead to supply reductions which will serve as the mechanism for future price gains. 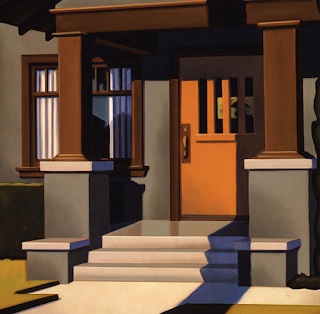 Extend periods of high prices will lead to new supply and future price declines. Seasonal - (Market situational) - More so than other asset classes, there are distinct seasonal patterns that lend themselves to changing risk premium. 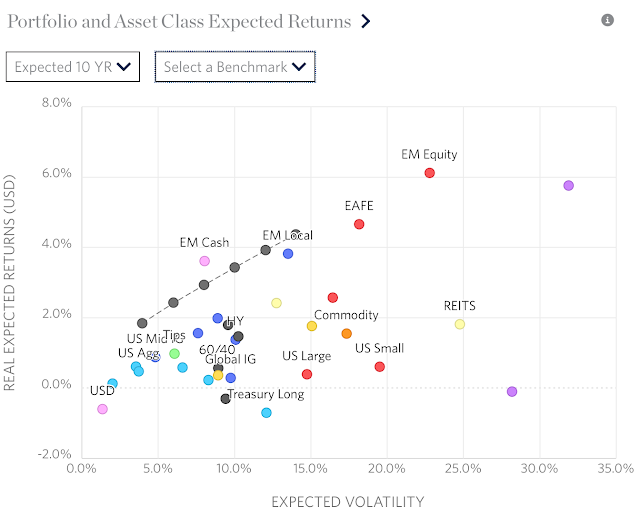 Volatility - The volatility risk premium is present like other asset classes; however, these premiums are more diversified relative to other asset classes given the low correlation across commodity markets. Commodity markets offer a wide set of alternative risk premium opportunities. These opportunities have improved with the end of the long-term super-cycle downturn. The dominate cycle factor has ended and has allowed more balanced investment opportunities. Investors should have a growing concern with the reach for yield in the current market. The reach for yield has pushed investors into illiquid issues where the risk profile has changed from credit/carry to credit/carry/illiqudity. Investors will generally receive a higher premium if an asset is illiquid. 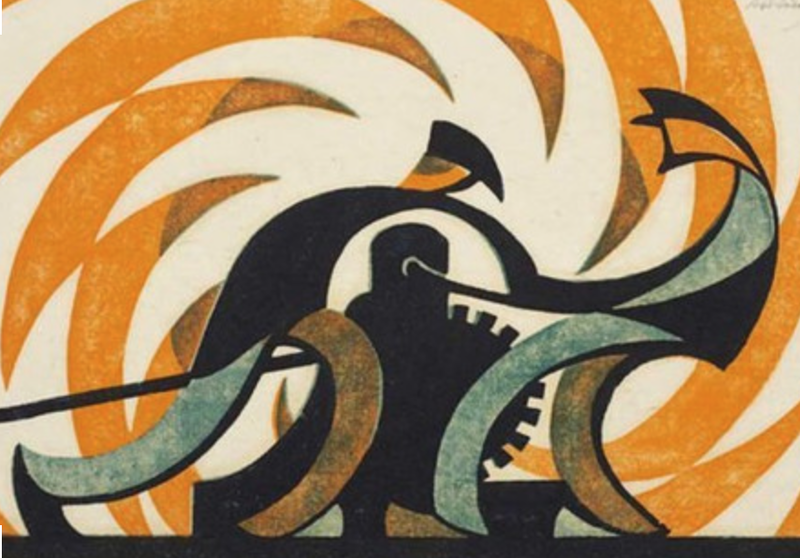 Unfortunately, illiquidity premiums are hard to measure; consequently, the traditional credit betas will not be properly measured and there could be the mistaken view that there is greater alpha from managers who hold these types of assets. Holding these investments may become painful if there is a change in the credit cycle and there is a need for liquidity but the market becomes one-sided. There is a difference between being paid for credit risk and being paid for illiquidity. 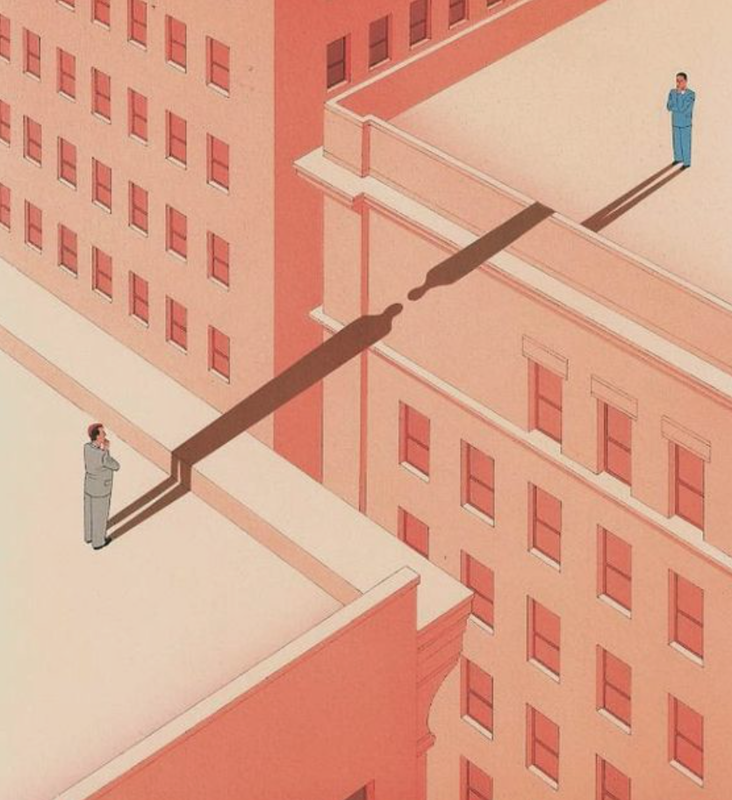 Credit risk will be associated with the underlying risk of the firm while illiquidity premium will be associated with the inability to find buyers when a sale is desired. Illiquidity is the uncertainty with matching buyer and seller and not with the underlying risk of the credit. Illiquidity, given it being situational, is inherently difficult to price. If there is the belief that liquidity and credit are become more expensive, it may be appropriate to switch risk premiums. We suggest that the risk premiums switch from credit to macro through managed futures. 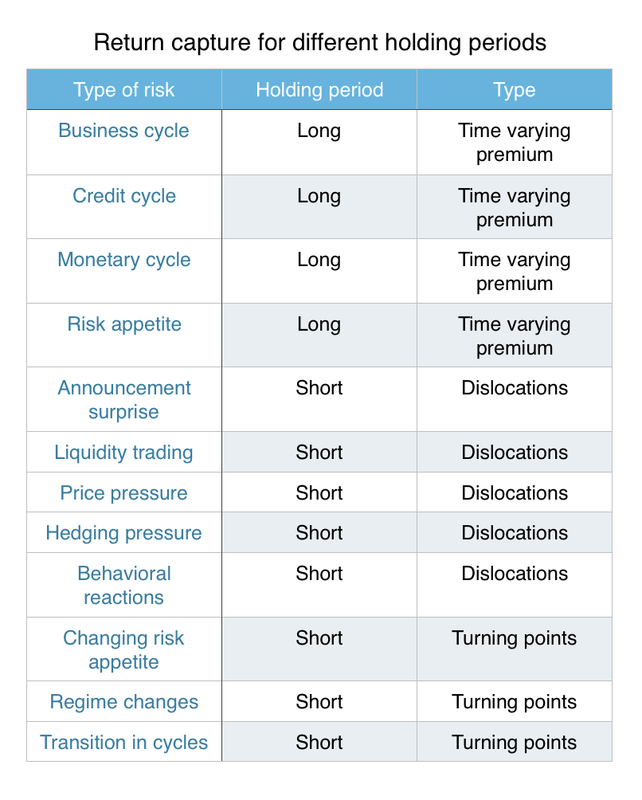 Managed futures managers will often blend risk premiums like momentum, carry, and value across major asset classes, but do it through using liquid instruments traded on futures exchanges. Since the futures investments requires low margin for a given notional value and the reminder of a cash investment can be held in Treasury, the managed futures investment can be compared to a credit investment. Credit and liquidity spreads can be compared against the average excess return for global macro/managed futures. 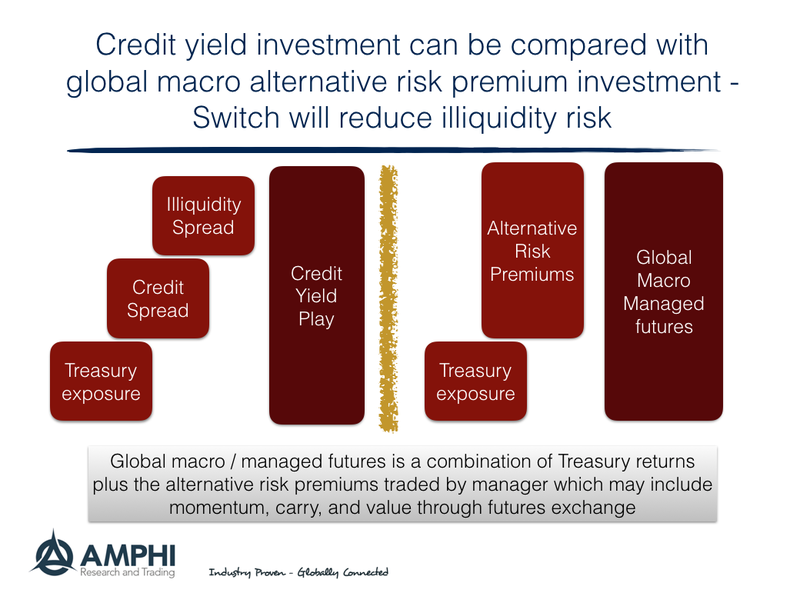 Right now, the return required to beat a credit play is at low levels, so a managed futures investment is attractive and also will solve the potential growing liquidity risk problem. 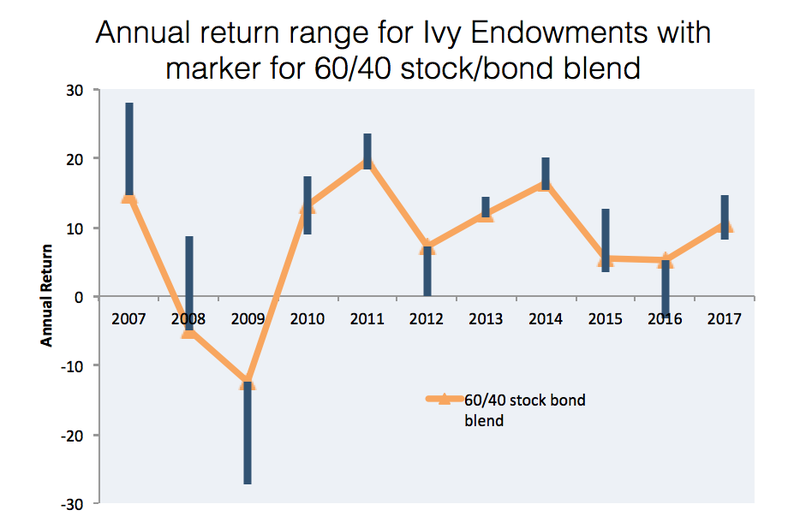 The latest performance numbers of Ivy League endowments have been nicely displayed in the chart below along with the 60/40 stock/bond portfolio. Since the development of the "endowment" model associated with Yale and the attention on Harvard, the largest endowment, there has been an unusual focus on these funds. There is a fair amount of dispersion between the best and worst managers in the group. Nevertheless, investors can compete against these more sophisticated funds by even just holding some variation on the 60/40 stock/bond mix. Three of the last ten years have seen the 60/40 mix at the top of the rankings. Twice the 60/40 mix has been at the bottom of the grouping. 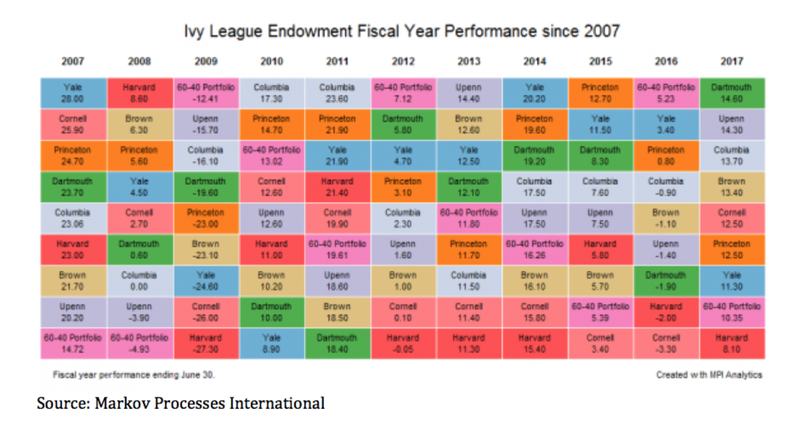 A large portion of the Ivy endowments has been associated with illiquid private equity investments. The 60/40 stock/bond investment blend is a liquid portfolio. It is possible that adding liquid assets that have higher returns than bonds or further diversification characteristics can generate more competitive returns to a simple 60/40 mix. A liquid investment strategy approach can compete with more sophisticated managers. 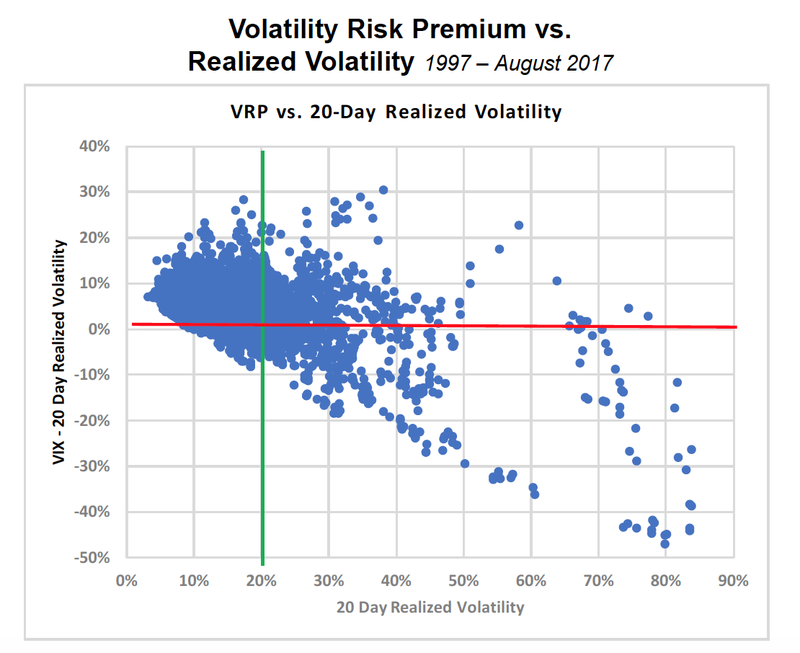 Implied volatility is usually higher than realized volatility so there is a positive volatility risk premium, except when there is a crisis or volatility spike at which time the volatility premium turns negative. A recent CBOE seminar presented a chart on the volatility premium to illustrate the risk. 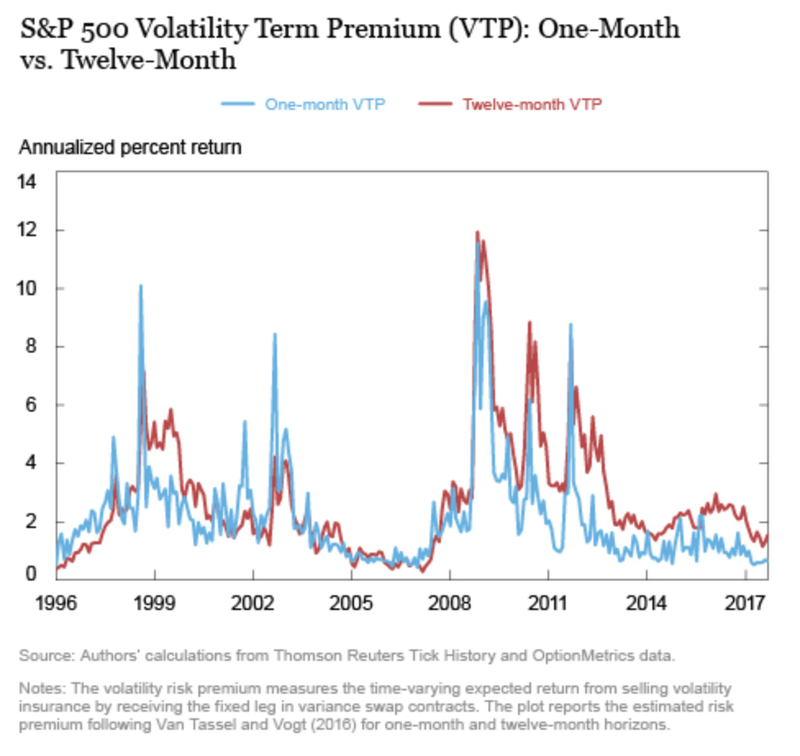 The numbers suggest that being short volatility gave you a positive premium in a stable world, but when the world is less stable, (higher realized volatility), you do not want to be a vol seller. 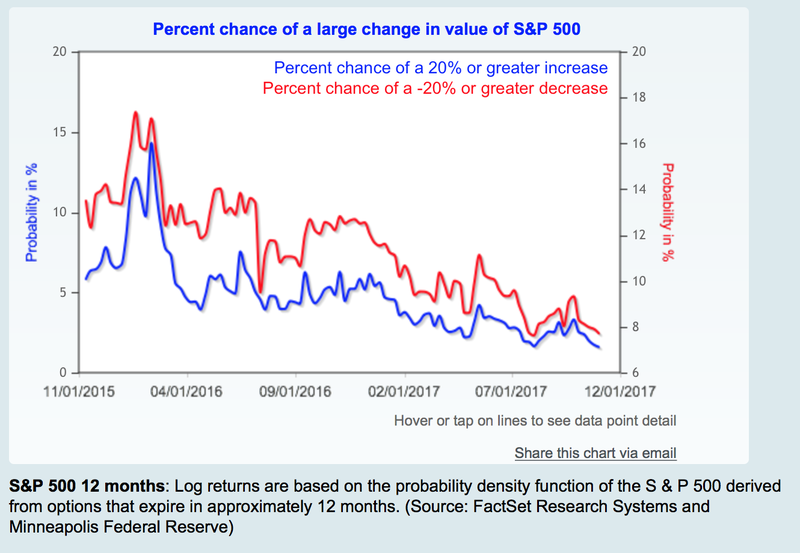 The chart suggests that there can still be a positive risk premium when realized volatility is high, but the odds work against you. It is a way to get to a realized volatility of more than 20% at current levels, but that world can become a reality quickly if there is an equity sell-off. It is important to measure your short volatility where you may have been picking up vol premium. If you have too much, now is the time to cut that exposure. Investors should be concerned about the unintended behavior from low volatility. Low volatility will lead to higher volatility in the future when investors become complacent about risk, the "Volatility Paradox". This paradox has been discussed by Richard Bookstaber as early as 2011 and recently referred to in a post on his blog, Our low risk (low volatility) world. 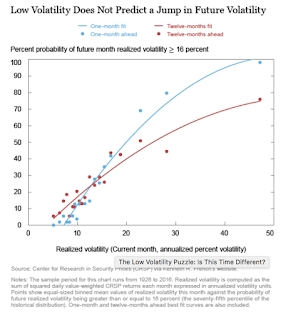 Low volatility is a variation on the prosperity argument used by Minksy to start the cycle of speculative excess. Low volatility lulls investors into thinking risk is actually lower than reality just like prosperity or no economic downturn will cause bankers to change lending practices. Because perceived risk is lower, there is a willingness to increase leverage and increase investment in riskier assets. Risky assets are bid higher which are then used as collateral for further leverage. This volatility argument is separate from the reach for yield because of low interest rates. 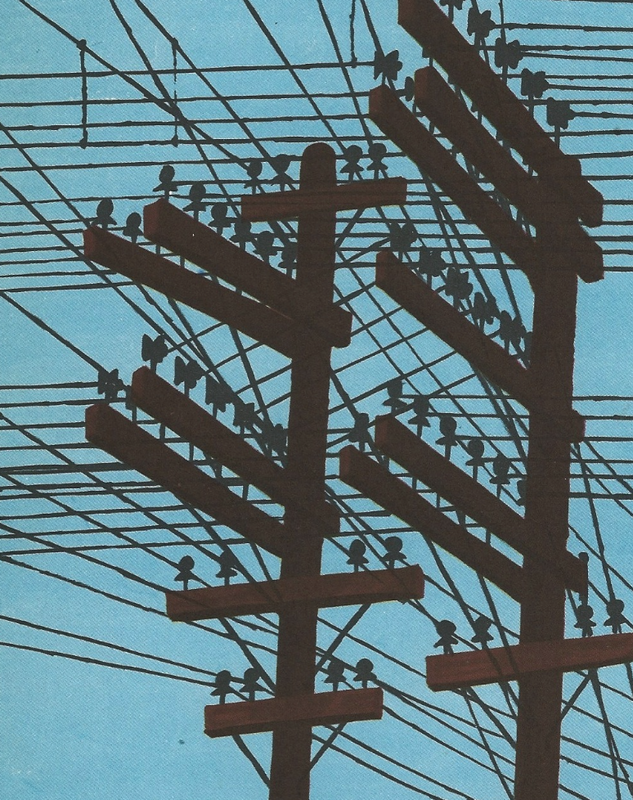 Risk-taking on low volatility makes the financial system more fragile. The problem of misperception by investors with respect to measured risk and actual risk is real. Investors may be placing too much stock in recent volatility and too much emphasis on standard deviation as the right proxy for risk. Low volatility today does not mean low volatility tomorrow. Low volatility today will create behaviors that will lead to more risk tomorrow. The smart investor should be looking for long vol or divergent strategies that will profit from an increase in volatility. Dan Fuss, the Loomis Sayles bond guru, has been working in fixed income for decades. He has developed a set of four "P's" with central bank behavior for looking at the macro fixed income environment and his read is suggesting that caution should be applied to any forecast that believes bonds are safe. Many of the P factors are longer-term and associated with shocks, so it may not be trade worthy, but for investors who are looking at longer-term asset allocation, this type of checklist is valuable. We have made our own assessment and believe the tilt is away from the credit sector and should be focused on global diversification or strategies that can perform better if there is a global economic shock. And not only the pride of intellect, but the stupidity of intellect. And, above all, the dishonesty, yes, the dishonesty of intellect. Yes, indeed, the dishonesty and trickery of intellect. Can intellect be dishonest? Not accepting behavioral biases is one form of intellectual dishonesty. We have to accept our decision biases before we can change them. Part of the behavioral revolution is the acknowledgment of our decision flaws. Intellectual honesty requires discipline with decision-making. Another interpretation is that there can be dishonesty to data. When data do not support a narrative, there is no truth. Ignorance is not knowing the data. Dishonesty is stating or believing a story that is not grounded in the data when you actually have looked at the data. Not accepting data is dishonest; nevertheless, there also has to be room for alternative interpretations of data. We are dishonest to the truth when we do not accept alternative arguments that better fit evidence. Why follow this line of reasoning? Are those who are not quants or data driven, less honest? Do quants or systematic traders have the moral high ground by being data focused and less biased? 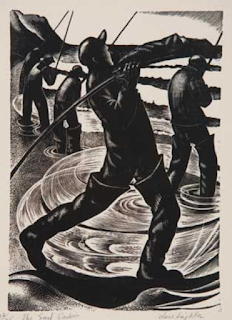 We are not proposing answers; rather we are proposing more self-reflection in an industry that is long on ego and opinions. Money management is humbling and financial painful if we are not honest with our knowledge and limitations. 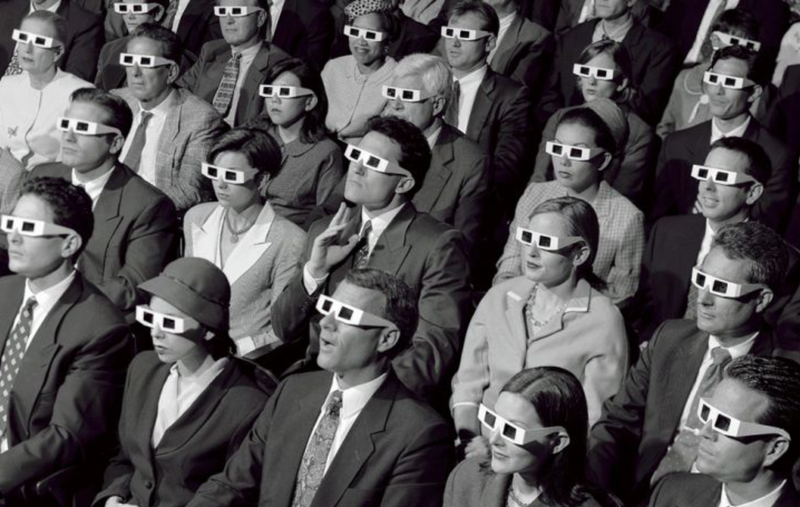 The movement to passive investing, the increased use of quantitative tools, the stronger focus on risk management, and the acceptance of behavioral biases are all indicators that we are learning to be more honest with our intellect. The spider chart is an alternative way of displaying data that may be useful at showing the strong diversification benefits versus different asset classes and alternatives. Correlations are looked at through a matrix form but the spider or radar graph may better display the most relevant information. Each node on the web may represent a different asset class and show the correlation of each to a single strategy. The spider graph provides a simple holistic picture of diversification benefits for a single strategy as well as a group. In the graph above we should the correlation of the SocGen management futures against a battery of other asset classes. Any other alternative can be overlaid on top of managed futures to show the relative performance. We have taken the spider graph which looks at managed futures across different asset classes and enhanced it through running a comparison with a general hedge fund exposure through using the HFRI composite fund of funds index. 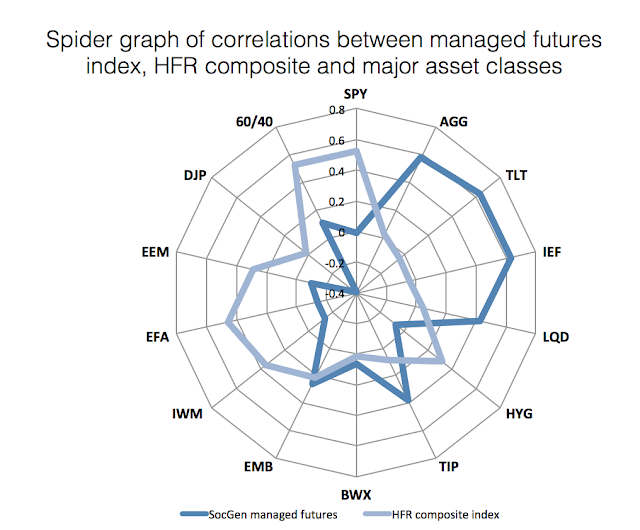 The spider shows that managed futures provide a great deal of diversification against equities and less against bonds. The HFRI composite does just the opposite. This shows the relative important of managed futures even within a hedge fund portfolio. Will hedging not speculation be the driver of a financial disaster? Is VaR hedging like portfolio insurance? Unlike earlier financial disasters, this one will emerge not because of too much speculation, but because of the inverse - too much hedging. Could this be the problem we are facing with the next financial crisis? 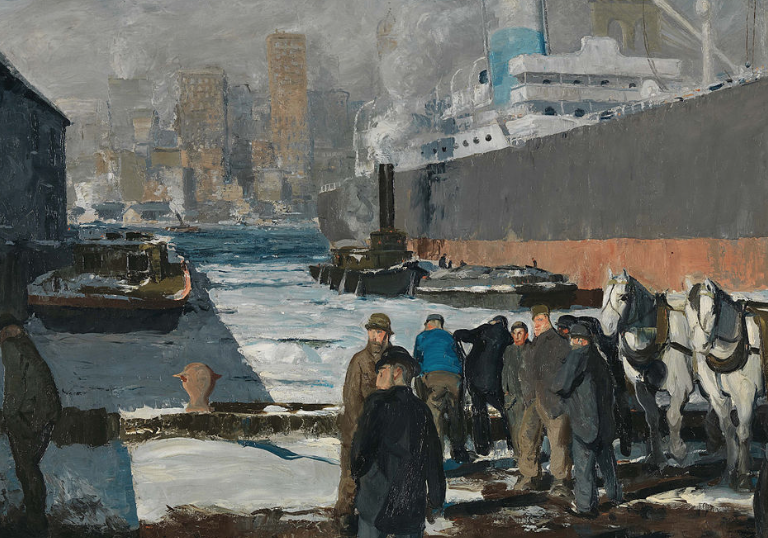 There has a significant amount of talk about over-valuation in equities and the reach for yield in fixed income, but there has been less focus on how a financial crisis will evolve. It may not be from speculators changing their views on the market although this could be a catalyst. Selling could be driven by those investors who are trying to hedge or mitigate their risk exposures. One of the contributors to the financial crash in 1987 was the impact of positive feedback strategies that reinforced the market decline. In particular, there was a strong link between portfolio insurance selling and the market decline. When employing portfolio insurance, as the market declined, there had to be more selling of equities and buying of bonds by those following this hedging strategy. Because the amount of portfolio insurance was so large, their selling activity dominated the market during the crash of October 1987. We have referred to this is a previous posts on the "paradox of prudence" and VaR - good for a manager, but bad for the markets as a whole - Call it the "Paradox of VaR Risk Management". It was hedging not speculation which drove the crash through waves of selling. Certainly, it was a feedback loop that needed to sell more as the market declined. We can see a similar problem with the current risk management techniques that employ a form of hedging through cutting exposure on volatility increases. 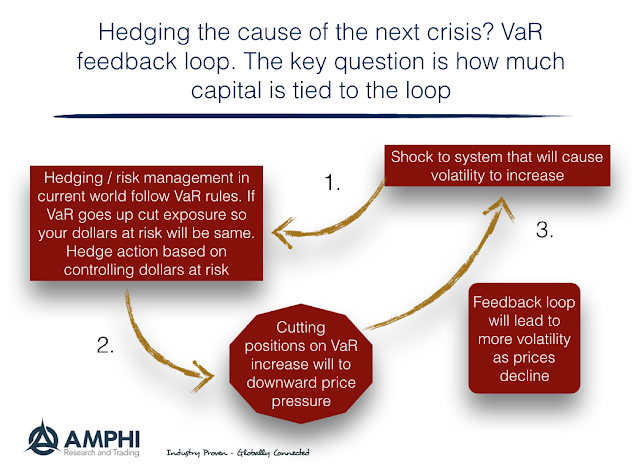 The feedback loop will add to selling when there is a volatility shock. An increase in VaR will cause investors to reduce their risk by selling the risky asset and buying the safe asset, similar to a portfolio insurance scheme. 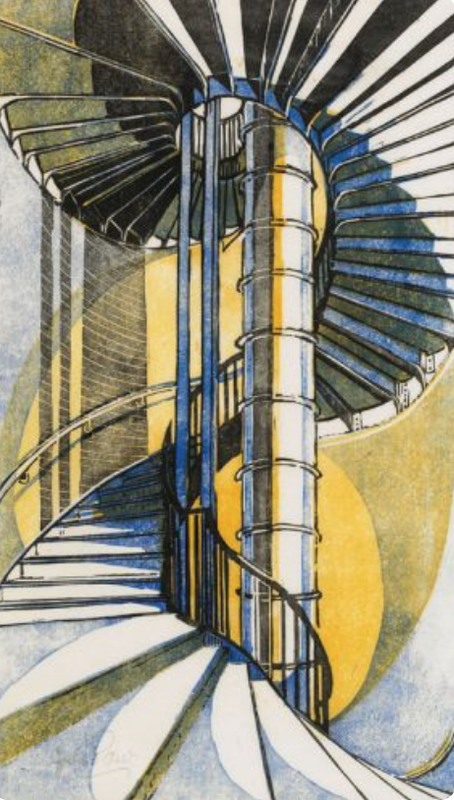 What is different is that investors will not sell just those assets that may be falling. There could be downward pressure on any markets that are seeing upward pressure on volatility. Positive feedback will actually place downward pressure on many markets. From the Minneapolis Fed we have market-based probabilities of a large up or down market move embedded in 12-month options. This is a good market-based view of a large up or down stock market move. If we look at the numbers from a year ago, the probability of a 20% or more down move was more than double the risk of a 20% up move over the next year; (13% versus 5%). Now, the chance of a 20% down move is approximately 8% and the chance of an up move is about 2%. The market has a tighter range but the change of a down move is still much higher than an up move. There is still skew to the downside but likelihoods have fallen. 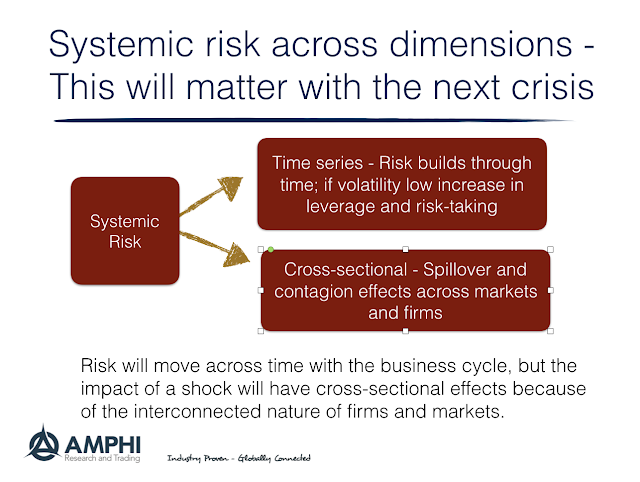 Our thinking of systematic risk has to be in two dimensions; one, the time series impact and two, the cross-sectional impact. These financial insights are coming from Markus Brunnermeier in his piece "Paradox of Prudence". The time series component focuses with the build-up of risks, and the cross-sectional component focuses with the transfer of risks. This leads to two paradoxes. The "volatility paradox" - Low volatility today leads to more risk-taking and higher leverage which will lead to more volatility tomorrow. 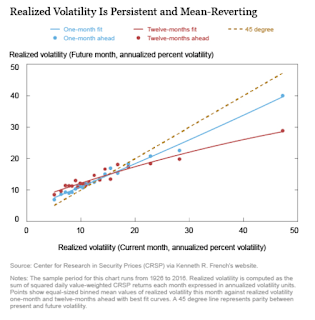 Low volatility causes more risk-taking which makes the economy more sensitive to any shock. The seeds of future risk tomorrow are found in the low volatility of today. 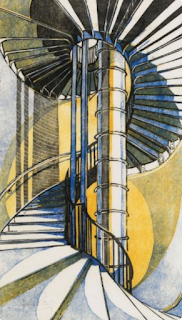 The "Paradox of Prudence" - Each firm tries to reduce risk exposure and be micro-prudent, but this leads to more systematic risk and is macro-imprudent. While some behavior can be market risk tampering, risk management can also be risk amplifying for the economy as a whole. 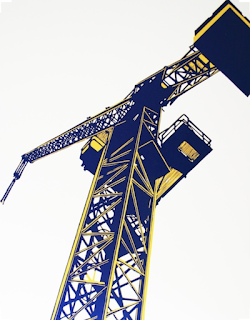 Attempting to control your risk will spill-over to other firm. We usually focus on the times series, but the actual risk will be in the networks between firms and the behavior of firms to specific risk shock. 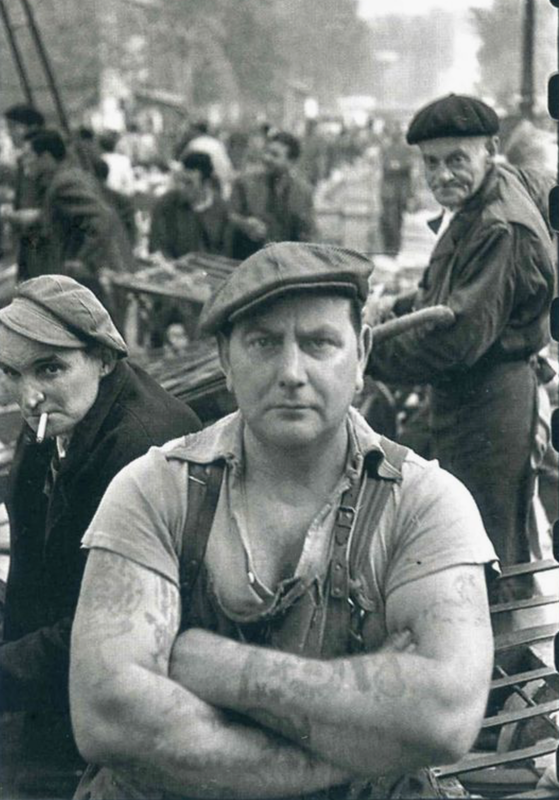 A shock to any firm will propagate through the economy through firm linkages. 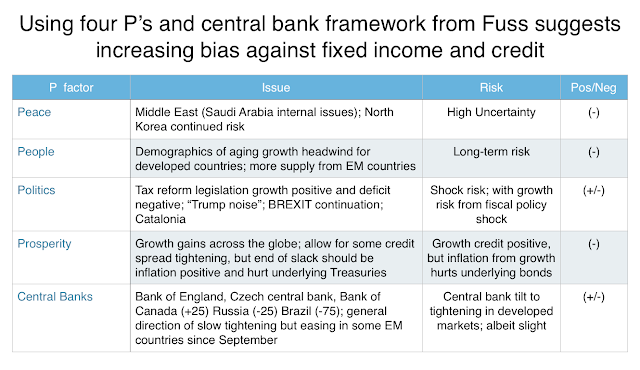 The potential advantage of global macro and managed futures comes from their ability to take advantage of cross asset class spill-over of risks. An equity shock may spill-over to bonds which can impact currencies. The global macro manager can trade these differences. Managed futures have been in a significant drawdown with poor Sharpe ratios over the last two years albeit October has been a good performance month. Many investors have talked about throwing in the towel and getting out of this hedge fund strategy. New investors have focused on other strategies and not waste their time with CTA’s. 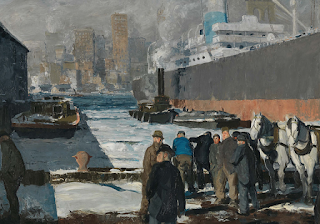 A simple approach of looking at recent performance would not be compelling, yet a closer examination shows that this may be one of the best times to invest with managed futures. Forget the recent performance or more specifically, do the opposite of momentum investors and buy on the dips in risk-adjusted performance. 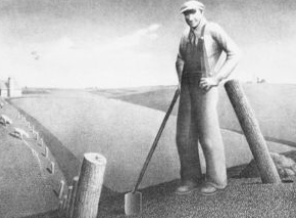 The investment people at Steben and Company have published a good piece of research on market-timing of managed futures called, "Can you Time Managed Futures?". 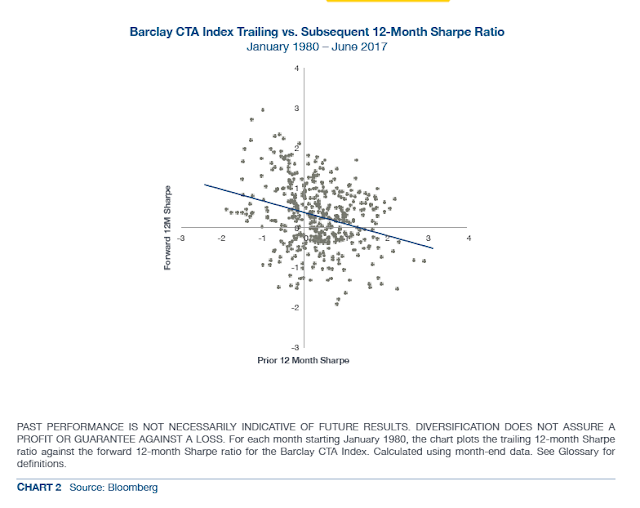 Their results suggest that there is mean reversion or negative autocorrelation with 12-month Sharpe ratios. Periods of very low Sharpe ratios are followed by strong risk-adjusted returns. Simply put, buy the dips if you are interested in increasing your allocation or investing for the first time. 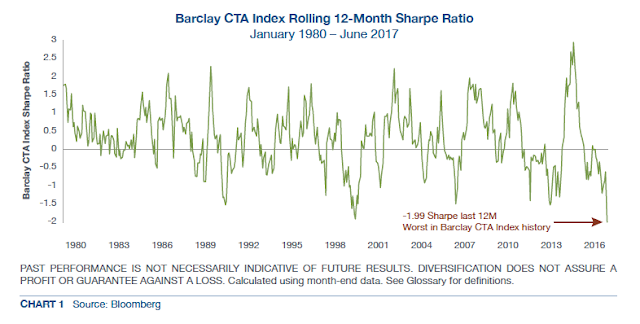 This mean reversion is present in every decade for the Barclays CTA index. This does not address the question of what manager should you buy if you want to increase your allocation, but it is a good start at looking at timing this hedge fund strategy space. We are currently conducting some research on how to choose which manager using a similar methodology of timing risk-adjusted returns. The decision for investing in any one manager is more complex, but the general timing decision may be easier to address. When the investment committee likes management futures the least may be the period when you should love it the most. If you are holding managed futures and ready to divest, think again, it may be worth waiting for the reversal.